He had gained fame for his rare achievements before and this time round Dinesh Subasinghe has done it again. 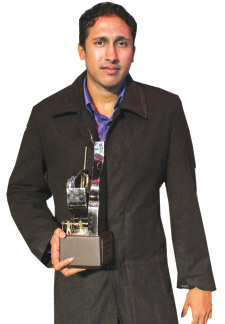 The talented youth became the youngest artiste to receive the best Music Director title in Sumathi Tele Awards history. Bagging the award at the event for his scores in Pinsara Dosthara, a smiling Dinesh informed the Daily News that the key behind his success is in creating a team of supporters and getting their help for the deed. "I did not divide the chores among them as the composer, arranger and orchestra. We more like a community working collectively to give the best of our talents for the production. I cannot take sole credit for the work," he stressed adding that he is grateful to his musicians, the production team and director Sunil Costa for their invaluable support. He notes that the first stages of the project have been hectic and that he had to be consistently reminded of the deadlines. "I had a calendar pinned on my wall and the crew consistently reminded when the tracks are due. I even panicked at times before deciding which scenes to take up for the day. I would work on the notes for hours until I finally locate something to work on. But the really good tunes usually turn up out of the blue when you are not stressed out and searching for a score," he explained. Talking about the project which won him his most recent accolade Dinesh noted that the teledrama is an adaptation of Scottish novelist Robert Louis Stevenson's The Strange Case of Dr Jekyll and Mr Hyde. He says that it was a complicated subject to tackle since it deals with the mental condition called 'split personality'. "The person embodies two personalities: the good and the evil. He deals with each situation differently. The shooting took place in the medieval backdrop of Galle Fort. My biggest challenge was to compose an appropriate score for this using many styles of vocals and world music genres such as western and Gregorian chants, Persian music and western classical string ensembles with fusion drums," Dinesh said. He also added that his vocals played a prominent role in the piece. He had introduced Melisma, singing of a single syllable of text while moving between several different notes in succession, to Sri Lankan TV music. With 17 years of experience in music Dinesh is now one of the most renowned composers in the teledrama and film scene. The youth started off his musical stint as a member of Stanley Peiris and Maestro Premasiri Khemadasa's orchestras. He formed his own band Dee R Cee in 2003. His first teledrama music score was for Chnadrathan Mapitigama's Humanne. Later in 2007 he introduced the age old musical instrument Ravanahatha to Sri Lanka via his first solo album Ravana Nada. In 2009 he received a scholarship to study at Oscar winning music director A R Rahman's Music Academy in India in which he was recognized as the best student in the instrumental section among his peers. He has many projects in his kitty. 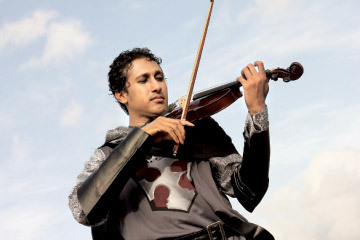 He will be composing music for Tennyson Cooray's new stage play Siwwamma Danapala, Minister Reginald Cooray's teledrama Sarada Bambaguru and Indika Ferdinando's upcoming movie. Director Roy de Silva too has invited him to compose music for his latest production. He is currently getting ready to handle the music and assistant direct the Grand Passion play 2013 produced by Prem Fernando and Cletus Mendis.